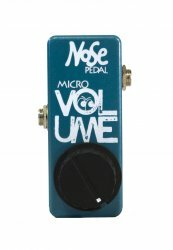 The Nose Micro Volume pedal is the perfect little volume pedal that you always wanted. This pedal is a fully functional volume pedal with both signal in and signal out 1/4″ jack connections. It's great if you need a small volume pedal for a small pedalboard, and it's PERFECT if you need an extra volume pedal at the end of your signal chain to control the overall volume of your entire board, or to cut all of your sound (hanging delays, reverb, effects) quickly while you are playing.